At the time of writing, Kennedy Ashia of Liberty Professionals FC is the highest scorer in the GLO Premier League 2012-2013. Ashia, an attacking midfielder, has scored six goals in seven matches. My first record of Ashia is from the “Division Two League” 2006-2007, the third level of Ghanaian football. Ashia played for Starke FC from Dunkwa-On-Offin. As far as I know, Ashia played for Starke FC during the “Division Two League” 2007-2008, winning promotion towards the end of the season. Ashia played for Starke FC during the “Division One League” 2008-2009, the second level of Ghanaian football. As far as I know, Kennedy Ashia made his professional debut for Liberty Professionals FC on 03.02.2010, during the GLO Premier League 2009-2010. Ashia played approximately 10 matches (0 goals) during his first season at top level of Ghanaian football. It is difficult to find information about Ashia’s performances during the GLO Premier League 2010-2011. I can not document that Ashia played any matches for any Ghanaian team between September 2010 and June 2011. 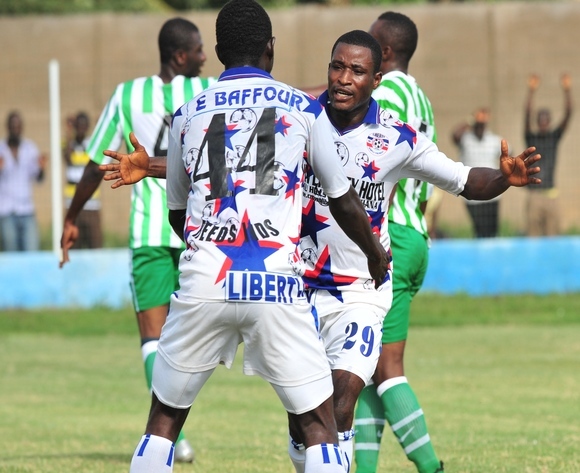 At the start of the GLO Premier League 2011-2012, Ashia returned to the first team of Liberty Professionals FC. Ashia featured regularly throughout the season, playing between 20 and 25 matches, scoring two goals. The current season, the GLO Premier League 2012-2013, has been a breakthrough season for Ashia. Previously, Ashia was considered as an utility player, comfortable as a right-back, right-winger or defensive midfielder. In January 2012, Liberty Professionals FC sold playmaker Michael Helegbe to Asante Kotoko FC. Helegbe left a gap to fill and Liberty Professionals FC tried out several players in the Helegbe-role. This season, Ashia has showed everybody that he is the right man for the job, impressing in an attacking midfield role, playing just behind the attackers. Ashia is a hard-working, dynamic player with excellent close control, passing, shooting and dribbling ability. Ashia is also a creative player who creates opportunities with smart passes. Apparently, Ashia has worked hard to improve his finishing. He has scored some wonderful goals this season, using his powerful right-foot. Ashia has also drilled home a free-kick and a penalty, showing expertise from set-pieces. Ashia is rather petit, most likely about 170 centimeters. There seems to be some confusion regarding the age of Ashia. According to his own Facebook-page, Ashia is born 13.12.1992. This piece of information is backed up by http://www.sports.com.gh, who recently wrote that Ashia was 19 years old. However; according to a registration document from the Ghana Football Association, written during the GLO Premier League 2009-2010, Ashia is born 13.12.1994. It is a fact that Ashia played senior football for Starke FC in February 2007. If 13.12.1992 is the correct birthdate, Ashia was only 14 years old at the time. If 13.12.1994 is the correct birthdate, Ashia was only 12 years old at the time. In November 2012, Ashia was named in the squad of the Ghana B national football team. As far as I know, this was the first time Ashia had been included in any of the Ghana national football teams. If Ashia is able to maintain his terrific form, foreign clubs will surely take interest in this exciting prospect. The picture is of Kennedy Ashia, celebrating with Ernest Barfo, and was found on MTN Football. How can I contact you regarding a player James Kwame Abban, it has earlier been written here that he is born 31.07.1988 but the correct date is 31.07.1991. It has been corrected in some other soccer sites, I wish to send you copy of his passport to avoid age confusion.